This week I noticed some issues with DirectAccess on my Windows 7 client. For some strange reason both Infrastructure and Intranet tunnels are not established. When walking through the Advanced Firewall configuration I noticed that Internet Protocol security (IPsec) tunnel mode security associations (SAs) were not initiated. After some searching if found a post on Forefront forum which describes more or less the same behavior. Thanks to Jason Jones if found my issue. By verifying the Name Resolution Policy Table (NRPT) configuration using netsh dnsclient show state and noticed that Direct Access Settings is misconfigured. The NRPT is configured using the DirectAccess Setup wizard. You can configure the rules also directly by yourself but take into account these settings are overridden when running the DirectAccess wizard! Microsoft® Forefront Threat Management Gateway (TMG) 2010 Service Pack 2 (SP2) introduces new functionality to Forefront TMG 2010 Standard and Enterprise Editions. To read the release notes, see the Forefront TMG Release Notes (SP2). Before installing this service pack, it is highly recommended that you read the TechNet article Installing Forefront TMG Service Packs. Installing the service pack on Forefront TMG computers in an order other than as described in this article is unsupported. Download a printable overview of Windows 7 deployment options for small and midsize organizations that includes the advantages and limitations of each option. Explore the different options for deploying Windows 7 in a small or midsize organization. This print-ready poster from the Springboard Series for Windows 7 features an overview of each method, details on advantages and limtations, basic requirements, and helpful links to additional tools and guidance. You’ll also find a helpful step-by-step overview of the Windows 7 deployment process. This week I had an issue with my DirectAccess lab environment which is based on the Test Lab Guide scenario “Demonstrate Forefront UAG DirectAccess Network Load Balancing and Array Configuration“. In the DirectAccess Monitor Reports one of the array members was not healthy at the Network Security, Teredo Server and Teredo Relay level. Last week I had some issue’s with connecting to corporate network by DirectAccess. 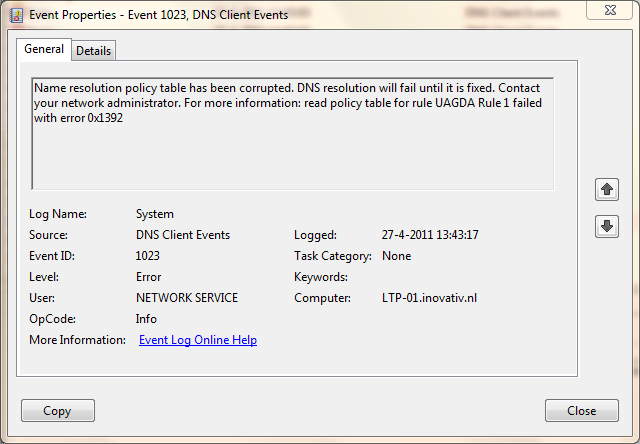 The System Log pointed me tot the following: Event ID: 1023 Source: DNS Client Events. Name resolution policy table has been corrupted. As you probably might know Forefront UAG DirectAccess deployment requires a public key infrastructure (PKI) to issue certificates to DirectAccess clients, the Forefront UAG DirectAccess server, and the network location server.